Russian Prime Minister Vladimir Putin insisted on the superiority of pipeline gas over alternative fuels on Wednesday as Moscow prepares to start building its biggest post-Soviet gas link to Europe. "Fortunately or unfortunately, neither solar power nor firewood nor dried manure can replace hydrocarbons in the next 20-25 years," Putin told a joint news conference with Finnish Prime Minister with Matti Vanhanen. "As far as natural gas reaching Europe by pipelines is concerned, this gas will always be cheaper than liquefied gas," said Putin. Many analysts would disagree with Putin as Russia's gas export monopoly Gazprom saw a slump in exports last year amid a global economic slowdown and due to a surge in unconventional gas supplies, such as gas extracted from shale, in the United States. Increased liquefied natural gas (LNG) supply and less voracious demand for imported gas in the United States than previously expected caused many tankers to head to Europe in 2009. The extra supply drove spot European gas market prices below oil-indexed Russian prices, leading Gazprom's customers to consume as little Russian gas as their long-term contracts allow so they could lap up the cheaper LNG. Gazprom, which supplies Europe with a quarter of its gas needs, has said consumption would return to normal over time but it has been forced to delay some of its projects including the giant Shtokman gas field in the Barents Sea. Putin spoke as Gazprom awaits final approval from Finland's environmental authorities that would clear the way to start construction of Nord Stream, Russia's biggest post-Soviet gas pipeline, which will be laid on the bed of the Baltic Sea. The link, which Gazprom wants to build together with Germany's E.ON and BASF as well as Dutch company Gasunie is meant to supply 55 billion cubic metres a year -- one tenth of Europe's gas needs -- to Germany and onwards. 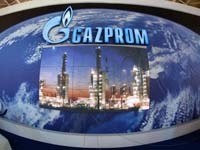 Analysts have said the link could stay partially idle as Gazprom has so far found customers for less than a half of its capacity. Gazprom could alternatively divert gas from other routes -- crossing Belarus or Ukraine -- to feed the link, but this would mean the new pipeline would not generate new revenue. Nord Stream and another key Russian pipeline, South Stream in Europe's south, were designed to help Gazprom boost security of supplies after pricing disputes with neighbouring Ukraine and Belarus cut transit deliveries to European customers.